The dust collector on Handibot has a problem. A clear plastic insert popped out during a cut. Does anyone have an idea on how to get it to stay in place? Is it glued in or pressed into place? It's a press-in part. I added it to prevent bristles from the dust foot brush from filling up with chips (as they tend to do when they're near the vacuum port and being tugged towards the vacuum tube during long cuts). 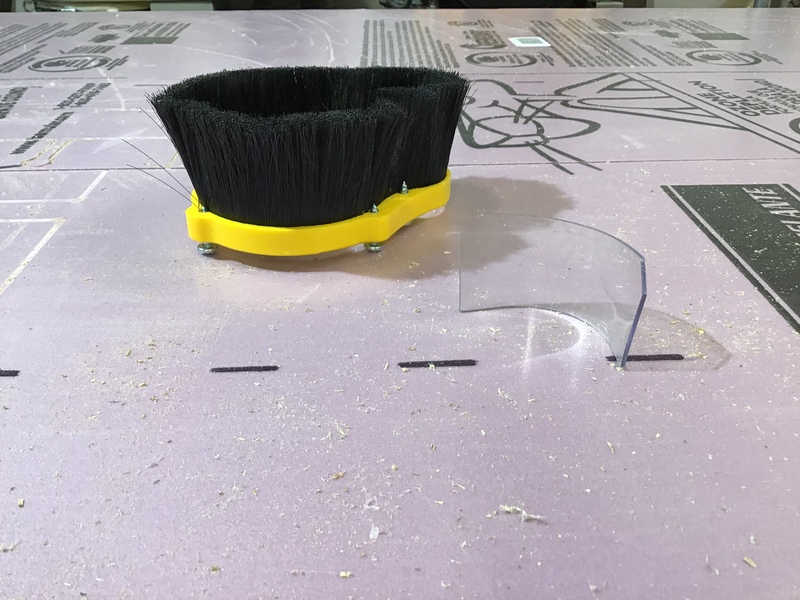 Just a couple of weeks ago one of our guys in production that runs a parts cutting tool came up with another solution--a piece of gaffer's tape applied to the inside of the brushes in the area near the vac tube opening. This holds the bristles together, but allows them to be flexible enough to not mar the surface of a part they come in contact with. That may be the way to go--rather than a vinyl insert.